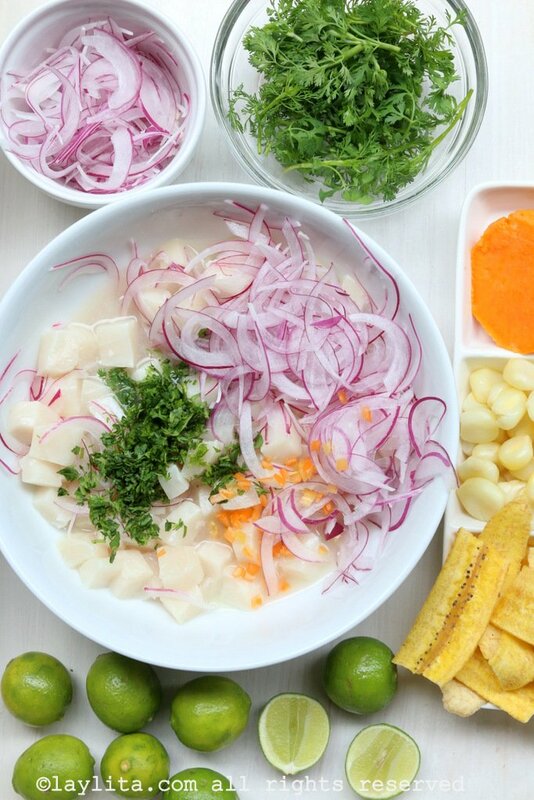 This recipe for Peruvian fish cebiche is preparared with fresh fish, limes, onions, spicy peppers, and fresh cilantro. 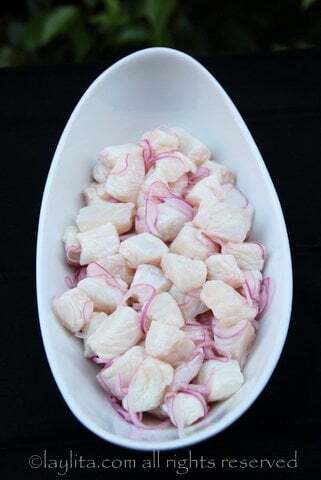 Cebiche, also known as ceviche or seviche, usually consists of seafood that is marinated with lime juice, the acidity of the lime juice actually “cooks” the seafood. 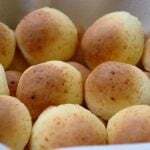 Not all types of cebiches are made with seafood and not all seafood cebiches are made with raw seafood. 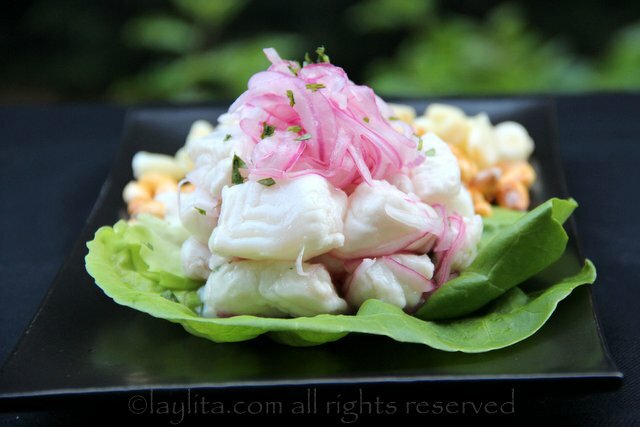 However, the most classic and traditional cebiche is usually made with fish and “cooking” it in lime juice is a must. 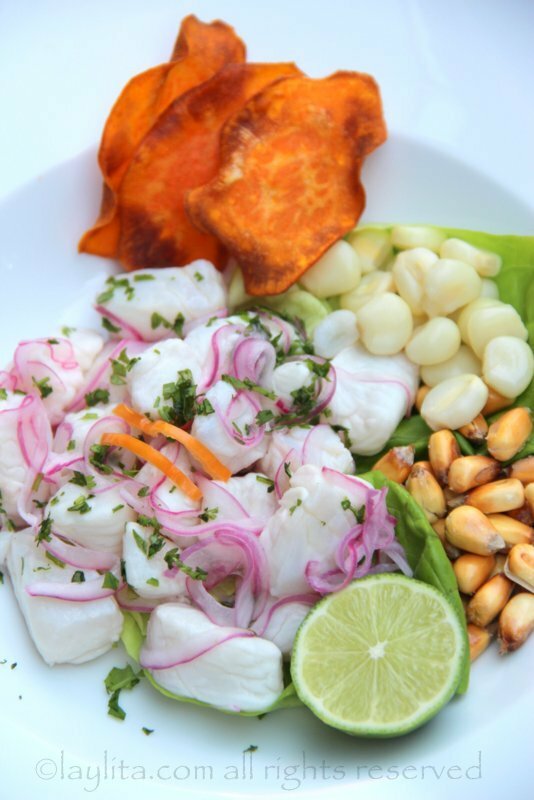 This is why it’s very important to use extremely fresh and high quality fish to prepare cebiche. 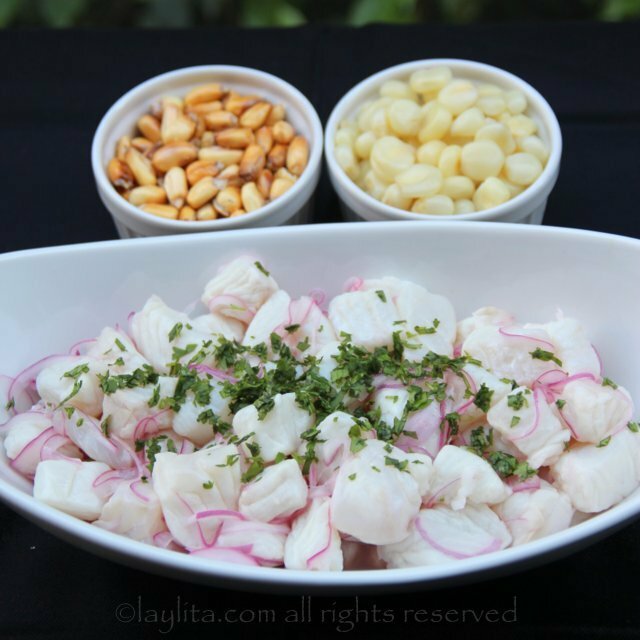 I’ve prepared this fish cebiche with halibut, mahi mahi (called dorado in South America), escolar, hamachi, and corvina (a type of fish found in South America that is quite similar to halibut). 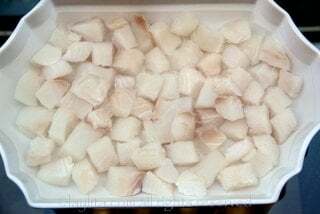 Cut the fish into small cubes, place in a glass bowl and cover with cold water and 1 tablespoon of salt, cover and refrigerate while you prepare the onions and juice the limes. 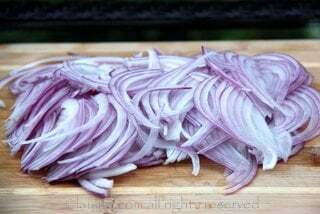 Rub the thin onion slices with 1/2 tablespoon of salt and rinse in cold water. 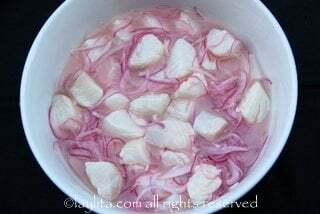 Place the cubes of fish, half of the sliced onions, and hot peppers in a glass bowl and pour the lime juice over the ingredients. Sprinkle with a little bit of salt. To minimize the acidity of the limes you can put a few ice cubes in the mix. Cover and refrigerate for about 5-15 minutes. Remove the cilantro sprigs and the hot peppers from the mix. 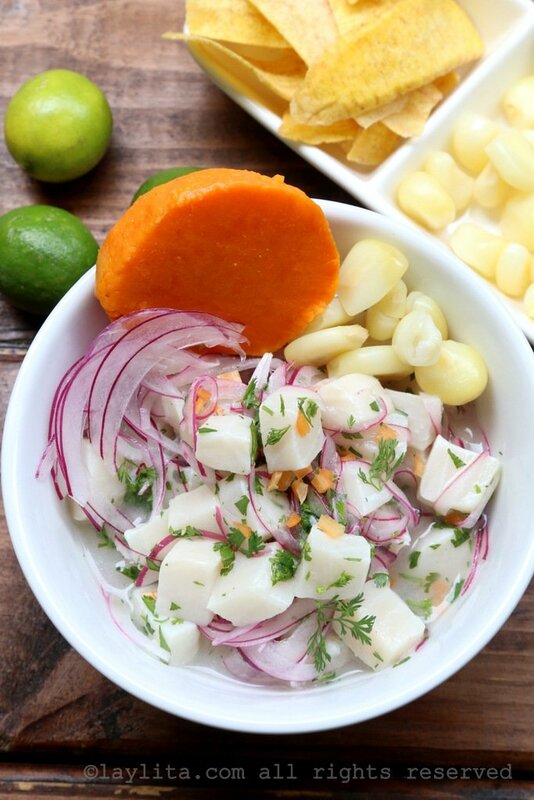 Taste the fish ceviche and add additional salt if needed. 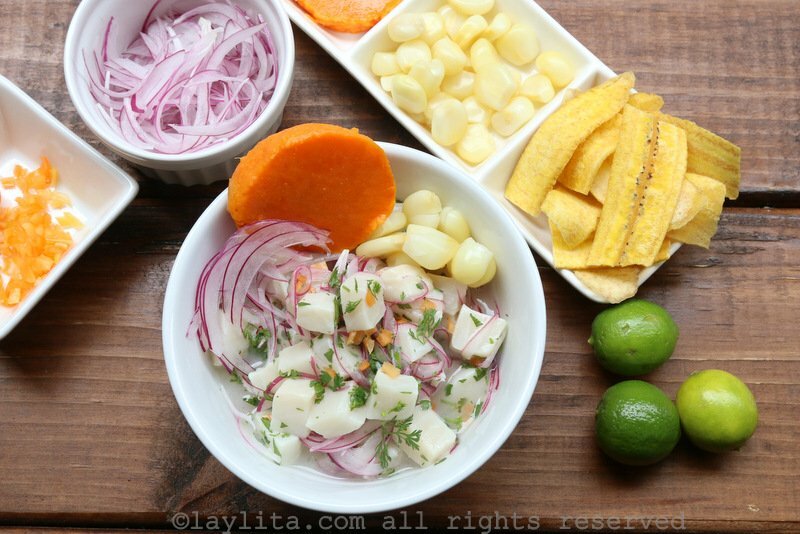 Use a spoon to place the ceviche in each serving bowl, add additional sliced onions to each bowl, sprinkle with finely chopped cilantro, and diced or sliced hot peppers. Serve immediately with your choice of sides and garnishes. Soaking the fish in cold salt water helps it keep a firm texture. Rinsing the onions with salt and cold water helps remove their bitterness. 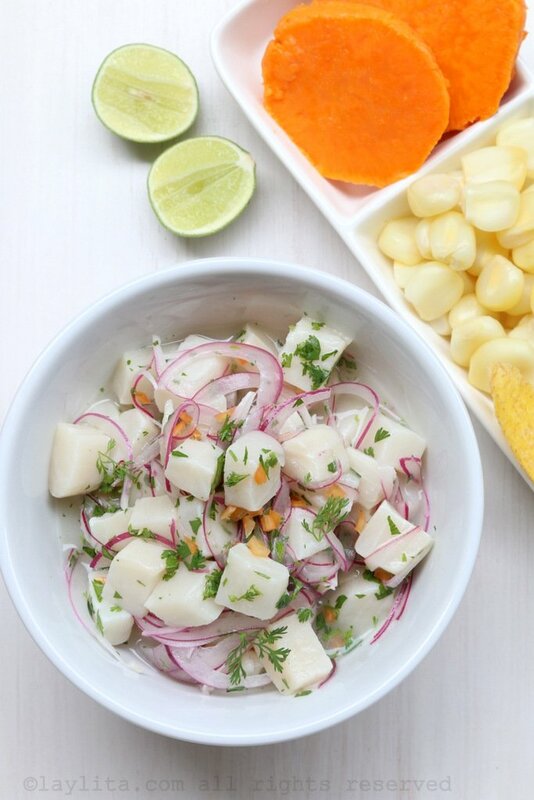 Adding ice cubes to the cebiche mix helps neutralize the acidity of the limes – this is especially true for the South American limon sutil variety, but less needed for the Mexican limes found in the US. 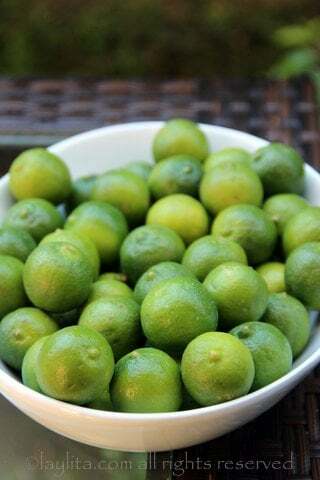 The type of limes used to make cebiche is also very important, in Ecuador and Peru there is a lime variety known as limon sutil, it’s slightly smaller than the Mexican limes found in the US and slightly larger than a key lime. 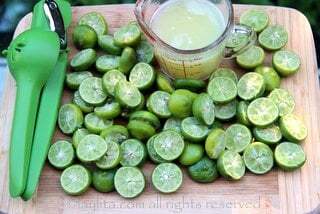 This type of lime has a higher acidity level than the Mexican limes and is able to “cook” the fish at a faster rate; its flavor is also more similar to a key lime. 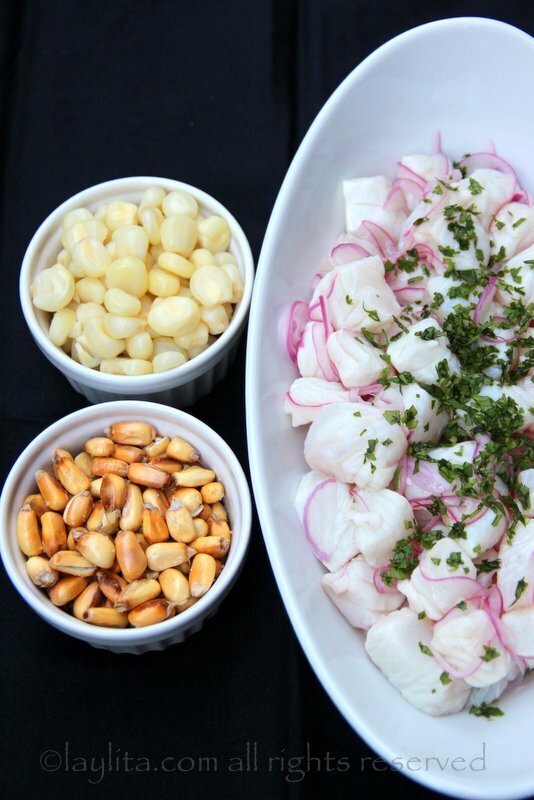 When I make shrimp ceviche, where I used fully cooked shrimp, I tend to use a mix of Mexican limes and key limes, but for fish cebiche – especially for the Peruvian version – I prefer to use only key limes. Yes, it is a pain to squeeze ~35 key limes and they have seeds, but the flavor they give the fish is completely worth it. 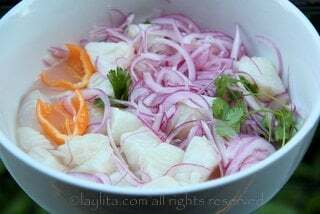 Peruvian fish cebiche usually includes some type of aji or hot pepper, one of the most popular is called aji Amarillo, which can be found frozen and/or canned in the most Latin grocery stores in the US. Another popular type of aji is called aji limo, which is very similar to a habanero. I love spice and heat so I used habaneros for this recipe, but you can also use aji Amarillo or a more mild type of hot pepper if you prefer. 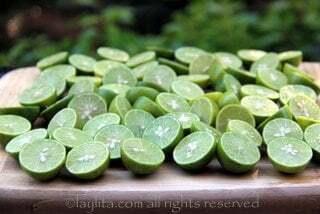 Also, the amount of heat isn’t the same as if you use the pepper in a salsa, you remove the seeds and veins, and use the pepper to infuse flavor into the lime juice and fish. I usually remove them after the fish is done marinating, and slice or dice them very finely, then anyone who wants extra heat can add them to their plate. 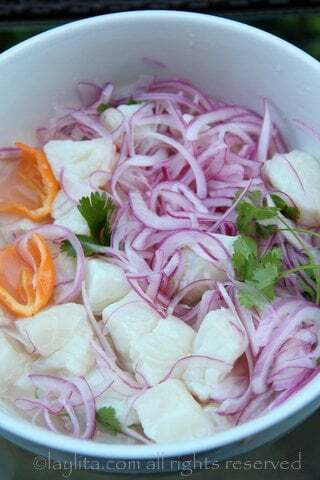 Peruvian style fish cebiche or ceviche is different than the Ecuadorian ceviche that I grew up with, some of the main differences are that the ones made in Peru tend to marinate for less time in lime juice, and the use of spicy hot peppers is more common in Peruvian cebiche. 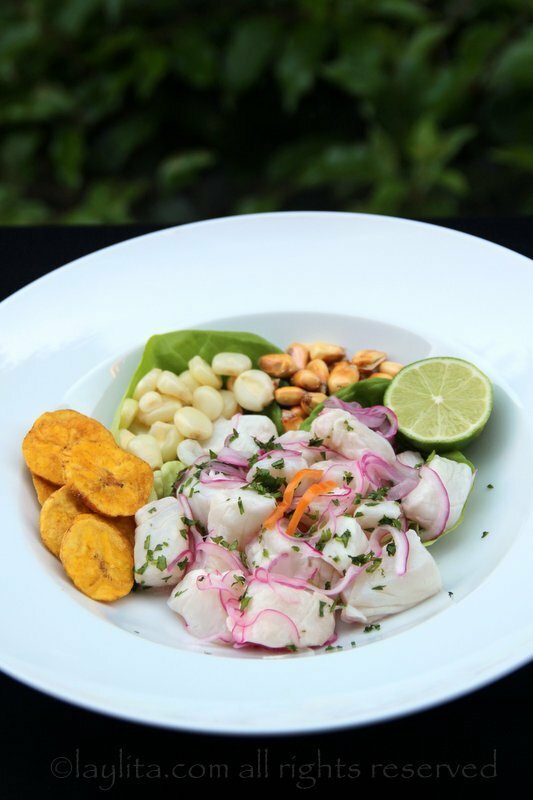 Also, the lime juice that the fish is “cooked” in the drained and removed so the cebiche is served more as a salad on a flat plate, while in Ecuador we usually serve it with the lime juice in a bowl (soup style). In Peru, they do serve the cebiche juice separately as a liquid shot called leche de tigre or tigers’s milk. 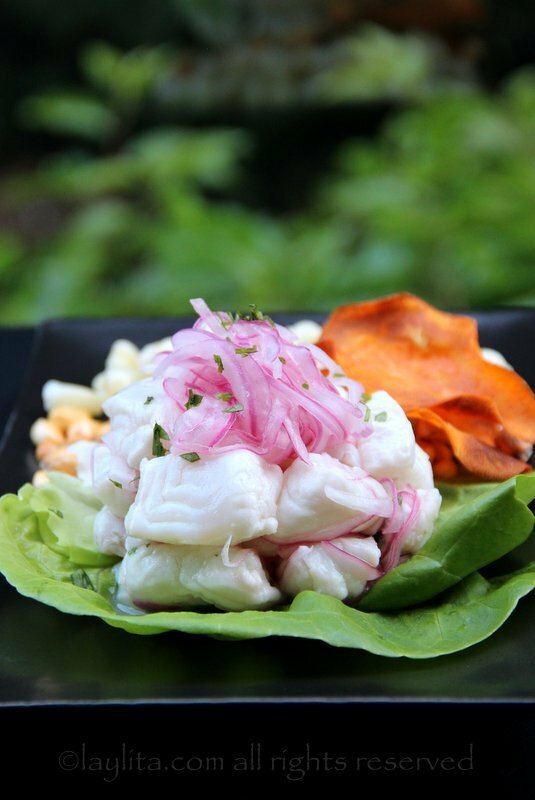 Peruvian ceviche is typically served on a lettuce leaf, with boiled choclo or corn, cancha corn or Andean style corn nuts, and sweet potato. The sweet potato is usually boiled and sliced, but you can also serve it with chifles de camote or crunchy sweet potato chips. 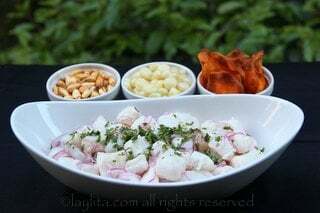 I also sometimes serve Peruvian fish cebiche with chifles de platano or green plantain chips. Hi Laylita! 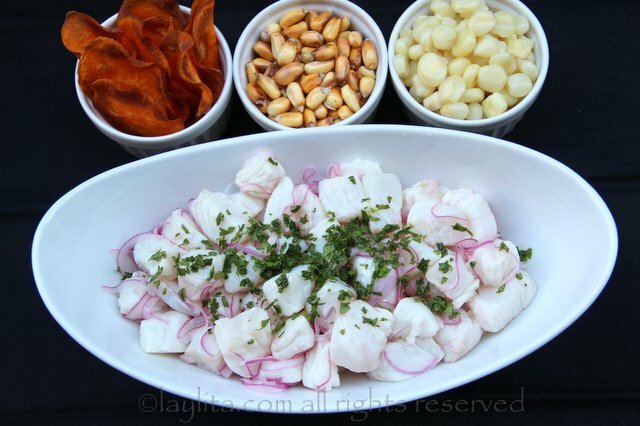 I have made Peruvian ceviche for many many years now, and this one looks amazing! 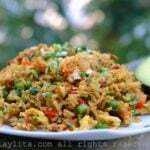 I lived in Guayaquil for 22 years so I also make the Ecuadorian one too. A German chef at the Oro Verde, had lived in Peru and taught me to use the juice of one orange to minimize the acidity of the limes. It works for me…I also mix some Peruvian aji amarillo paste with the lime juice but have to be cautious because some people can or will not eat spicy food. We moved from Ecuador to the U.S. 10 years ago and I still miss the Ecuadorian food terribly. Thank for all your fabulous recipes!!! Hi Layla! How many people would this recipe serve? It looks amazing!!! Thanks for sharing. 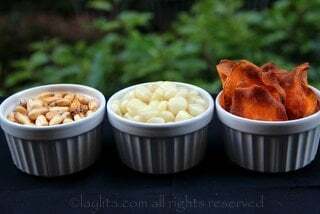 Hi Cam – It’s for 4-6 people as a regular appetizer, you could stretch it to 8-10 as a sampler/small bite appetizer. 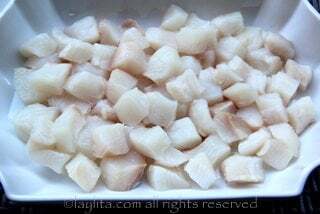 Can grouper be used if halibut is not available? Yes, as long as it’s very fresh. Thanks Layla! I lived in your beautiful Ecuador for 22 years (1983-2005) and absolutely love (and miss) the wonderful food. Still trying to find tomate de arbol and corvina…oh well, guess we have to learn how to substitute, right? 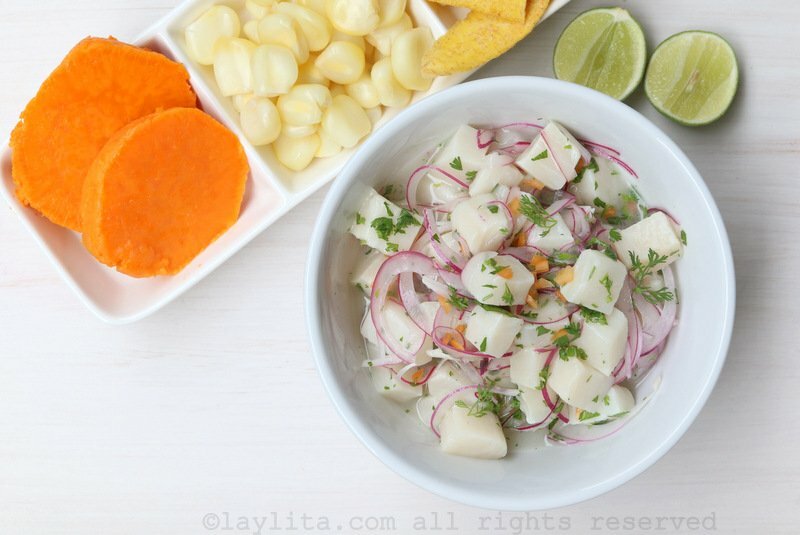 Gracias Layla por tomar tiempo de compartir tus recetas! 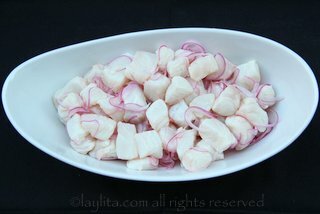 Je vais essayer de faire ce ceviche pour mes amis le réveillon du 31 décembre. La recette est semblable au ceviche péruvien que j’aime tant! Felices fiestas a tu familia desde Burdeos! Wow! This is about the most beautiful presentation I’ve ever seen. Amazing clarity and colors on your photos. Nice work! I love how refreshing this looks. For those of us looking for healthy, skinny recipes, this is perfect. 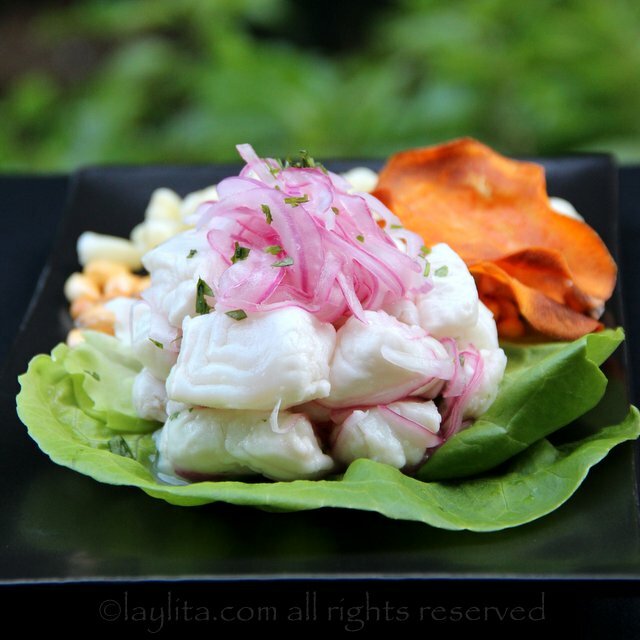 Beautiful ceviche Layla! it looks so yummy! !